I work part-time at a department store and was hurt during my shift. Will I still be covered by workers’ compensation? Augusta Personal Injury Attorney Chris Hudson Helps Bring It Augusta personal injury attorney Chris Hudson helps you "just bring it" to the insurance adjusters who don't feel they need to pay your claim! Learn more here. Workers’ compensation benefits and coverage are governed by very strict rules detailing who will be covered and under what circumstances. This can often intimidate people who may be seasonal or part-time employees, causing them to miss out on important coverage that they may otherwise be entitled to. Fortunately, in your case, it seems as though you meet the standard requirements of workers’ compensation, which demands that the injured party be an employee of the company in question and that the injury must have happened at work. Essentially, you claim relies on two things: who you are in relation to the company, and how your injury occurred. Many injured people miss out on filing a workers’ compensation claim simply because they assume that one must be a full-time employee to take advantage of the benefits offered. In fact, any regular employee—full-time, part-time, or seasonal—is eligible to receive workers’ compensation benefits after a work place injury, as long as they receive a wage and have taxes deducted from their paychecks. 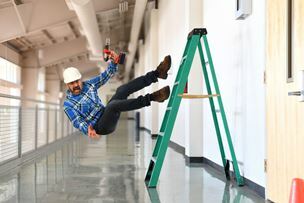 This typically means that contractors, volunteers, and interns will not be eligible for workers’ compensation in the event of an on-the-job injury. Another key determination of your workers’ compensation eligibility is how your injury occurred. In order to receive benefits, you must have been injured while you were at work performing the required duties of your job. If you were setting up a display and slipped off a ladder, you would likely be covered; if you were on break and scalded yourself taking your lunch out of the microwave, you may not receive coverage. Your injury must also have required professional medical attention in order to be eligible for workers’ compensation. If a simple fix with the first aid kit patched you up sufficiently, you will not be able to seek benefits. Workplace injuries can be very confusing for victims. Are Your Injuries Covered by Workers’ Compensation?